Professor Parker is the Director of the Cape Town Component of the International Centre for Genetic Engineering and Biotechnology (ICGEB). Prior to accepting this position, he was the Head of the Division of Medical Biochemistry and Director of Research for the Health Science Faculty at the University of Cape Town. He obtained his PhD in Biochemistry in 1979, completed a postdoctoral fellowship with Gary Stein in the USA and returned to join the Department of Medical Biochemistry in 1981 where he was eventually appointed as the DG Murray Chair of Cancer Research. He was also promoted Ad Hominen to full Professor in Medical Biochemistry. He has been Director of the MRC Oesophageal Cancer Research Unit since 1998 and was awarded the DST/NRF Research Chair in Cancer Biology in 2007. He was President of the South African Society of Biochemistry and Molecular Biology (SASBMB) between 1998 and 2001, is founder Secretary General of FASBMB (the Federation of African Societies of Biochemistry and Molecular Biology) and served in this capacity between 1996 and 2003. He is a founder member of the Academy of Science of South Africa and served as General Secretary from 2000-2004 and in 2010 he was elected Vice President of the Academy. He was appointed onto the 14-member international jury panel for the Loreal/UNESCO Awards for Women in Science for the period 1997-2002. He currently serves on the Executive Committee of the International Union of Biochemistry and Molecular Biology (IUBMB) as the Chair of the Committee on Symposia and Chair of the Wood/Whelan Travel Fellowships Committee. 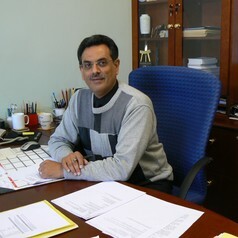 In 2003 he was awarded National Science and Technology Forum (NSTF) award for "Outstanding Contributions in Science, Engineering and Technology", in 2004 he was awarded the South African Society for Biochemistry and Molecular Biology Gold Medal for his contributions to biochemistry and the Oettle Medal in 2009 by the Cancer Association of South Africa for significant contributions to cancer research. In July 2015 he was invited to address the United Nations Security Council members of the 1540 Group of Experts on Biorisk Assessment.